A Wildstorm comic book podcast for Wildstorm addicts by Joe David Soliz and Benjamin Murphy! 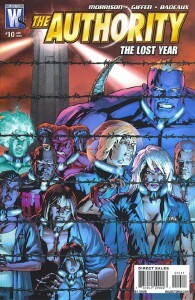 Here we are finally and so ends half (looking at you Wildcats) of the redemption for Worldstorm and this titled which had been put on hold since Grant Morrison left it in 2006. It has been a bumpy ride to say the least but it is very interesting how they chose to end this. All of you who have been following our coverage of this title know that for the most part we’ve been really frustrated with it. Morrison had a strong start when he worked on it, so when Keith Giffen was announced to take it over it seemed like a good fit. Giffen, after all, had already written these characters several times. But somewhere along the way, it seemed that this series as a whole just started to fall apart. One thing that was evident was the story arcs were way too short. 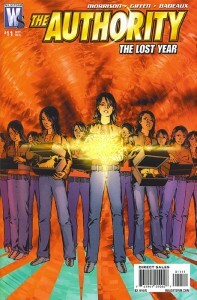 There were several alternate worlds that the team visited that were really cool but only lasted two issues. This led to a lot of great set up being resolved super fast in order to move on to the next alternate reality. In-freaking-credible! 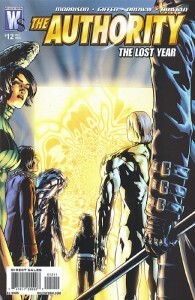 I wish all of Lost Year had been like these last two issues. Everything came together in this issue; the story was engaging and once again we’re treated to amazing art by Brandon Badeaux. Badeaux’s art is what really made this arc for me. It is incredibly detailed and combined with Jonny Rench’s colors makes for some of the best art in a comic I’ve seen in a long time. 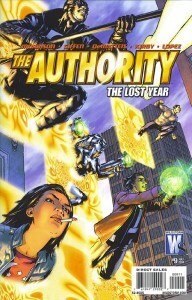 Plus, Badeaux’s designs for the alternate reality Authority are just wicked! I’ve heard people say they don’t think Badeaux could handle a monthly book because his art is so detailed. Personally, I’d wait on a bi-monthly book if he were doing the art. It’s that good. FINALLY! An issue of Lost Year I really like! I haven’t liked an issue this much since issue 6 (which ultimately let me down with the following issue). The difference here is I now know this little arc will be resolved next issue. Would I like for it to run longer? Hell yeah! Especially with Brandon Badeaux drawing it. But for now I’ll take what I can get. I am truly shocked but I actually thought this issue was okay. Last issue really frustrated me to no end and I dreaded picking this one up. But there were several factors that were different about this issue that I think slightly improved it from the last one.